FRIES Rack System proper care of glassware. The innovative FRIES rack system sets the standard. Highlighting the importance proper care and maintenance of glassware and matching the rack to the glass size. The needs of the hotel, restaurant and catering industry continually grow, and ever more products are on the market. That is the case for glasses, plates, trays and other pieces that have to be washed. Whatever your needs may be, we definitely have the right rack for you. The product line includes diverse solutions for washing glasses, plates and cutlery in commercial dishwashers, as well as for transport and storage. No one offers more options than we do! FRIES rack systems CLIX and it’s ready! Simple assembly without tools, available in 11 standard heights from 73 to 260 mm. A rack that takes the measure of every glass! The height of the rack can be precisely adjusted and customised to the height of the glasses. 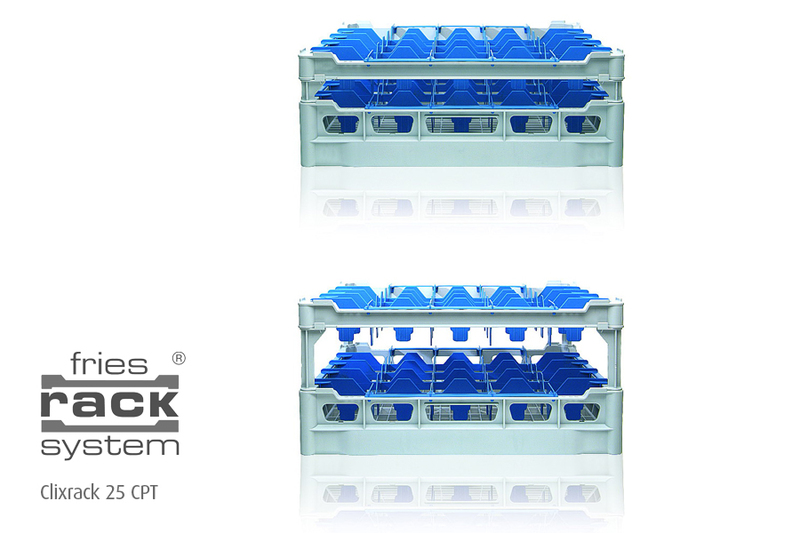 The open rack design ensures water access for a better wash- ing result. Also the glasses dry more quickly. 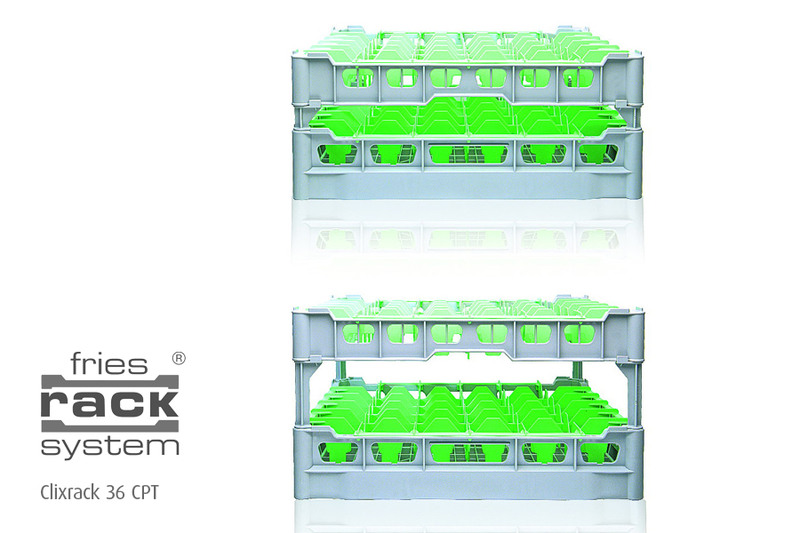 At the same time, the glasses are optimally protected, and the racks can be easily stacked. The racks can be fitted with tilting clips at customers’ request. This allows water to better drain from the bottom of the glasses. The edges are rounded, and the racks can be easily and comfortably held with the side handles. The racks are lightweight, and their contents can be easily checked. 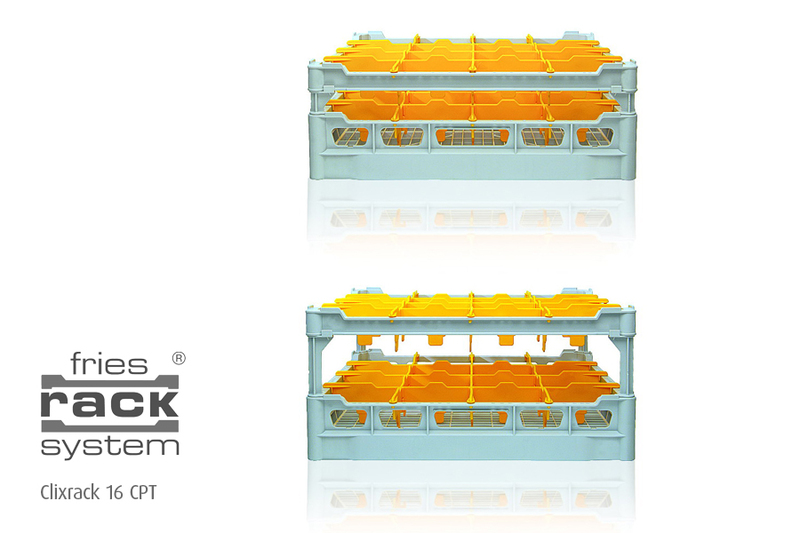 Two bottom levels: the rack’s upper bottom holds the items being washed, while its lower bottom serves as a cross piece, ensuring better stability during transport. Less sagging, fewer unwashed spots (narrower webbing) and no damage to the contents from transport hooks. You can easily choose the right type of rack with the help of the FRIES measuring chart. The chart makes it easy to choose the correct compartment size and rack height. The coloured compartments can be combined with six different frame colours, making it easy to place glasses in the right rack. You can also individually design and label your racks by hot foil embossing your lettering or logo. Coding clips in different colours serve as another way to differentiate your glass racks, which can also be em- bossed. If you would like to receive details of our special price promotions and offers, as well as details of the very latest products and innovations from our world-leading brands, please subscribe here. An Irish family owned business, specialising is the distribution of the highest quality tabletop and foodservice products, from Europe's major manufacturers, to the hotel and restaurant trade throughout Ireland. Less is MORE, City Dwelling. April 9, 2019 • Comments Off on Less is MORE, City Dwelling.